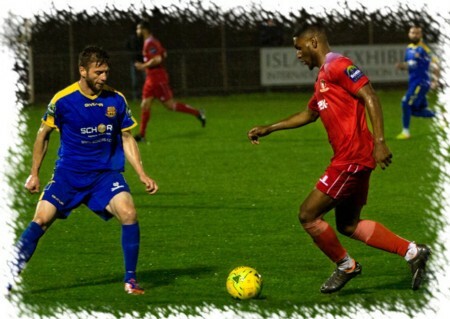 Hayes & Yeading took advantage of the two sides above them drawing as Paul Hughes' United maintained their 100% Bostik League record at the SKYex by hitting FC Romania for five while also hitting the woodwork on no fewer than four occasions. 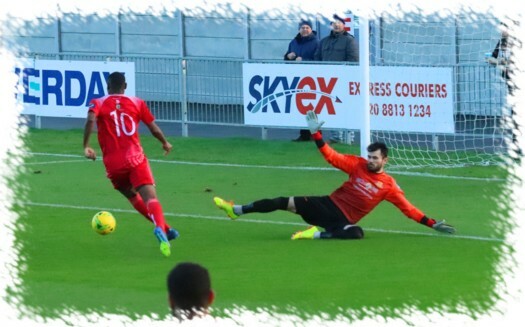 United started very quickly and could have been ahead within 30 seconds when Ed Asafu-Adjaye sprayed the ball to Toby Little on the left, his first time centre was spilled by FC Romania 'keeper Adrian Darabant but Lewis Toomey's effort was hacked off the line. The lead was not long coming though as in just the fourth minute skipper Scott Donnelly collected the ball just outside the Romania area and slid in Hassan Jalloh who duly dodged around Darabant before sliding the ball home from an acute angle (aside and below). An effort from range by George Taban for the visitors was handled easily by United's stopper Andrew McCorkell on his home debut before a smart move from United saw Jalloh find debutant Rylan Myers on the right, his whipped cross was met by a flying Lee Barney but his header was wide of the target. Seventeen minutes had elapsed when number two arrived. Jalloh collected a short corner, turned his marker on the bye-line before pulling the ball back to Scott Bridges who fired home from the edge of the six yard box. 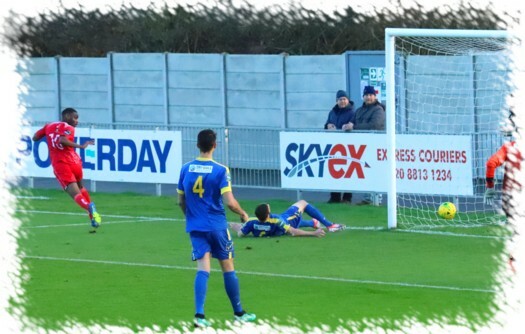 Three minutes later United hit the woodwork for the first time as Barney fed Toomey, his low cross being reached by a sliding Toby Little at the far post with his shot beating Darabant only to go wide off the base of the far post. The woodwork denied Little again minutes later as he cut inside from the left and let fly with his weaker right foot only for the ball to cannon back off the crossbar with Darabant well beaten. Two minutes later a defensive mix up saw United concede in somewhat sloppy fashion as Chid Onokwai broke onto a loose ball before coolly chipping McCorkell to bring life back into the visitors. Just before the half hour mark United created the last opening of the half when Bridges neatly chipped the ball over the Romania defence to Barney, Darabant saving with his feet to deny the United striker a twentieth of the campaign, the half-time whistle seeing United with a 2-1 advantage. After a quiet end to the first half, the start of the second was no different with the first real chance coming just before the hour mark. Jalloh sent Little away on the left, his cross to Barney seeing the strikers header held at point blank range by Darabant. Five minutes on and a rare opening for the visitors saw Onokwai beat Liam McDevitt to the bye-line before seeing his shot from a very acute angle well held by McCorkell. The midway point of the half finally saw Barney strike his 20th of the season, Jalloh's right wing cross was headed out as far as Little who headed the ball back into the danger area where Barney collected and fired the ball past Darabant from six yards. Two minutes later and United had a fourth when Barney won the ball in the box before looking up and unselfishly rolling the ball to Jalloh who slid home his second of the game. United's fourth was quickly followed by the visitors being reduced to ten men when referee Anastasiou showed a second yellow card, and subsequent red to Cosmin Sandu. With a man advantage and being three goals to the good, it was no surprise that United dominated the remainder of the game. Myers cross from the right on 75 minutes saw a Barney header blocked by Darabant at point blank range, the loose ball falling to Donnelly who was inches wide from 20 yards. Within seconds Jalloh pounced on a loose ball and cracked a 25 yard drive off the crossbar, the same crossbar denying Donnelly soon after with Barney's follow up being blocked wide by Darabant who was also alert enough to push over a Little shot after he received the resultant corner that was played short. With three minutes remaining United got a fifth and Little a tenth of the season from his wing-back position. 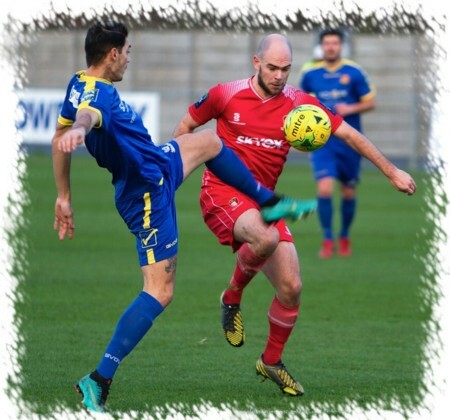 Substitute Josh Chamberlain beat Taban on the left, his centre was flicked on by Ash Nzala to Little who controlled the ball before curling a shot beyond Darabant into the far corner. Photos by Ray Peploe (top 2) and Montimagemedia (bottom 2).